Niles West students will be attending presentations on Tues., Sept. 12 as part of a new anti-bullying and social awareness curriculum. 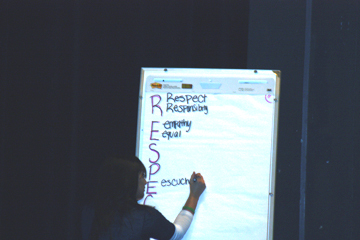 The day of presentations will replace the Names Assembly used in previous years, which featured freshman students telling their classmates about experiences they had with bullying. Each grade level will have their own presentation. Seniors will meet first period for a seminar on sexual misconduct and alcohol; freshmen will spend second period going over “cyber-civility,” including sexting and social media etiquette; third period, juniors will learn about bullying, diversity, and inclusivity; and sophomores will attend a presentation on respectful relationships and dating violence during eighth period. Assistant principal of operations Mark Rigby expressed his wish for students to get the most possible out of the event. Many students had positive things to say about the format for the presentations. However, not everybody thinks that students retain what they learn at presentations. Presenter Katie Koestner, a student safety expert, will also be hosting a seminar for parents on Mon., Sept. 11 in the Niles West South Lobby at 6:30 p.m. The presentation, “Not My Kid: What Parents Need to Know about Bullying, Harassment, Cybersafety and Sexual Misconduct,” aims to further parents education on how to facilitate conversations about sensitive subject matter with their teenagers. Head coaches, co-curricular sponsors, and administrators will also be attending presentations on Monday. Koestner will be educating them on policy, procedure, protocol, and prevention (the four P’s), as well as on determining appropriate boundaries with students and bullying behavior. All student presentations will take place in the auditorium during their designated class period; there will not be a special bell-schedule for the day.